The Minions of Despicable Me are some of the most adorable and annoying characters to be created. For Despicable Me 2, the animators have come up with a great new catch phrase which is sounded as an alarm by one of the firefighting minions. 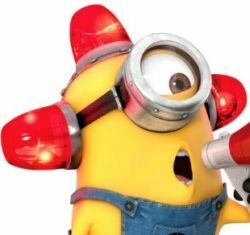 This one-eyed minion (who according to Facebook is Carl not Stuart) wears flashing red beacon lights on his head as he sounds the "Bee-do, Bee-do" alarm. Adorable, Right? I've been so taken by this new character that I figured out how to make your own alarm hat at home to wear to the Despicable Me 2 premiere (Turn off the alarm in the theater) or as part of a Halloween minion costume. 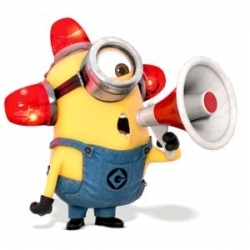 For a basic minion firefighter hat use the siren one. I know my daughters won't let me wear an alarm hat out in public, but I might be able to wear a flashing red light headband, headpiece or necklace. I knew the Despicable Me minions were going to be a big hit with this new minion noise, but didn't realize just how big until we heard a 5-year-old boy going through the store saying "Bee-do, Bee-do" after seeing a picture of the minions. This new catch phrase is one of their most popular ones yet. Be sure to Vote on your favorite Minion expression in the polls below. Read on to learn out how to make your own alarm accessories (hats, headbands, lanyards and necklaces) and use them to assemble a Minion Firefighter costume. What do you think about Despicable Me 2? Pretty good, for a #2 version. Not planning on seeing it. 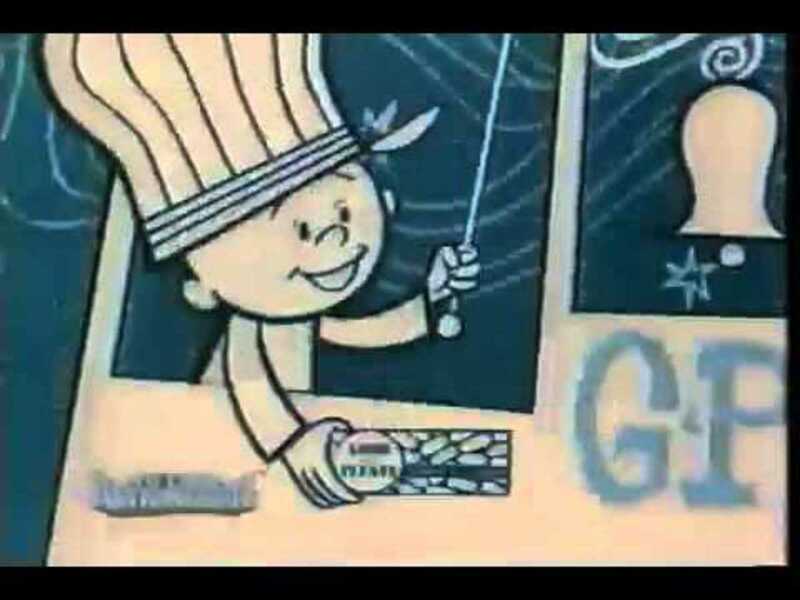 Video clips featuring the newest annoyingly clever catch phrase from the yellow minions. Find out why the firefighting minions sounded the alarm. This cute minion fireman action figure can serve as the inspiration for your Minion fireman costume. You just need to add a fireman hat to a basic minion costume. From Despicable Me on Facebook. If your favorite expression isn't on the list, add it in the comments. What is your favorite Minion expression? Looking at the alarm-sounding minion, it appears that the red siren alarms are just attached to his head, almost growing out of them. Obviously attaching alarms to the top of someone's head will not work with a real person, so you need some way to keep the flashing lights on your head like with a hat or headband. Using a hardhat helmet, is one option for a starting base for the alarm hat. Another is to re-purpose a drinking hat, remove the tubing and use the side cradles to attach the red lights, turning it into an alarm hat. One of the biggest challenges in making a Bee-do alarm hat is making sure that the siren lights are not too heavy for the hat and will remain in place once attached and of course that the overall weight is not too much to wear on one's head. 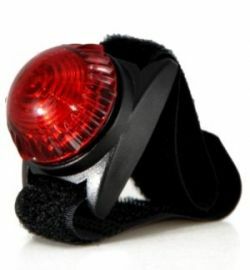 Using light weight siren lights and slightly smaller lights, like walking or emergency lights, which can be reused after the hat's usefulness is over. Start with a Hard Hat, Drinking Helmet or Headlamp. Remove any extraneous hardware, straps or tubes that will not be used. Find three flashing alarm lights, siren lights or red dog lights. Attach the flashing red lights one to the top and two to each side using wire, duct tape or a very strong glue. Try on hat. Adjust lights if necessary. Make sure the on/off switches are accessible. Practice sounding the alarm, "Bee-do Bee-do"
Do not activate your alarm hat in the movie theater. Using a hard hat helmet is a good starting point for making an alarm hat, although attaching the alarms to the hat will take some strong glue, or a lot of ingenuity. The drinking helmets make it easier to attach the flashing lights. Just remove all of the drink tubing and replace the beer or soda spots with flashing lights. The drink hardware on the hats makes it easy to attach the flashing sirens. A headlamp with adjustable strap is another option. Just attach two more flashing lights. Drinking hat in yellow that can be turned into a Bee do hat by adding alarms. This comes with a Red LED option which is a flashing light. To complete the look you need two or three flashing strobe lights or a smaller, more stable dog lights. Make sure to get ones that are battery powered. The dog light comes with a clip and a Velcro collar which could be easily attached to a hat or a headlamp strap. Red 4 inch security light. Extra accessories to add to your minion firefighter costume. This best selling megaphone has a built in siren, so you can sound an alarm with the megaphone too. Wear a backpack with fire hose attachment as a way to spray water with your minion fire fighter costume. In Despicable Me Gru asked Dr. Nefario to make him a Dart gun, instead, he made the Fart gun, which made it's appearance in a 22 gun salute in Despicable Me 2. 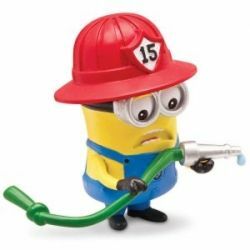 If you don't want to go all out as a firefighting minion, carry one of the other main Despicable Me gadgets, the fart gun. Since I knew my daughters were not going to let me wear an alarm hat out in public, I tried to figure out what else I could do that was still involved red lights, flashing and a bit more subtle. Brainstorming I came up with ideas for making a flashing red light headband or headpiece or wearing a flashing red necklace or lanyard. Using an indestructible headband from SOL REPUBLIC an alarm headband can easily be created by attaching one of the Adventure Guardian lights (or two or three) to the headband. Two other quick and easy options for wearable flashing lights is to make a flashing lanyard or turn an ordinary cord necklace into a flashing one by clipping on one of the 1 inch sized safety lights. The red flashing safety light necklace is likely to be the one that we'll wear to the Despicable Me 2 premiere; it is festive and just a little bit flashy. I will probably have to leave the Bee-doing up to my daughters. Adventure Guardian Dog Light available on Amazon. Start with a headband, lanyard or necklace cord. Choose smaller alarm, safety or dog lights that will work with the headband or necklace cording. For the headband - Attach one to three smaller alarms to a sturdy headband. Use the dog light that comes with a clip to make it easier to attach. For the lanyard - Attach one of the dog lights to a lanyard. For the necklace - Hang one of the dog lights from a necklace cord. Try on headband, lanyard or necklace. Adjust lights if necessary. Make sure the on/off switches are accessible. 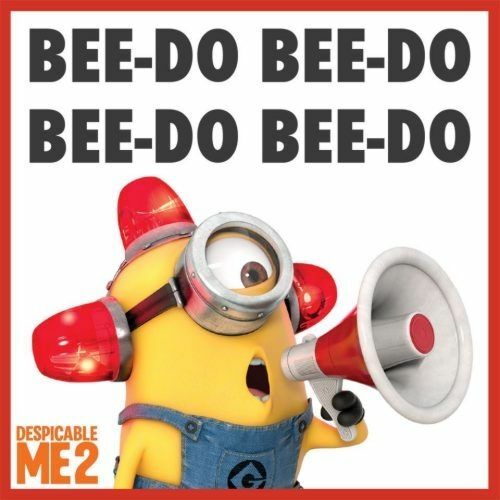 Practice making the minion fire alarm noise, "Bee-do"
The clip-on walking lights and safety lights are a smaller more convenient size for those who want to sound the alarm on a more subdued scale. This light flashes in red. Safety flare measures 3.9 x 3.2 x 1.7 inches. Alarms can be attached to a substantial headband like those from soundtrack for an red light headband, or to a lanyard or necklace for another look. The indestructible headbands from SOL REPUBLIC are used as part of their headphones and could be used to create an alarm headband by attaching a clip-on alarm. Putting together a Minion Fireman costume is pretty easy. Just use the fire fighting minion action figure to the right for inspiration. The fireman hat that comes with lights and sirens is the more economical way of creating the minion fireman look. For an easier (and less expensive) option, use a pre-made fireman helmet with build in lights and sirens. A fireman helmet with siren and flashing lights. A premade fireman's helmet wired with flashing lights and sirens in yellow. This teaser trailer for Despicable Me 2 features the Banana song. It is one of those annoying, but cute songs that just gets stuck in your head. If you discover you want to learn the works, watch the version with subtitles, or see the lyrics on my lens "The Minions are Back in Despicable Me 2." You can also see how the evil minion reacts to a banana in an early animation clip for the new minion movie. This page was created for a summer challenge on the Squidoo platform. 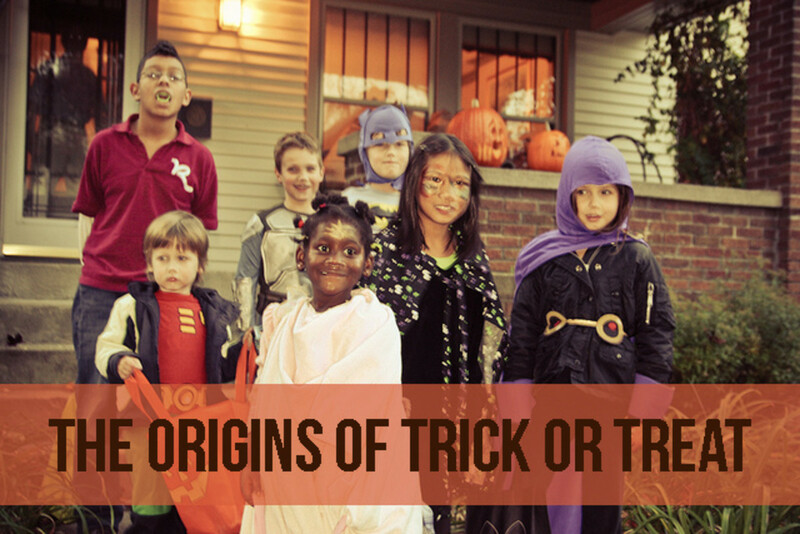 The challenge was to write a new Halloween page for the 2013 Halloween season. Needless to say it is fun to create a new costume idea lens for 2013, based on one of my favorite cartoon characters, the minions. Will you be making a Minion fireman costume or alarm hat? lol my husband still makes that noise! @billymar: Annoyingly adorable. I agree. So annoying but so adorable. 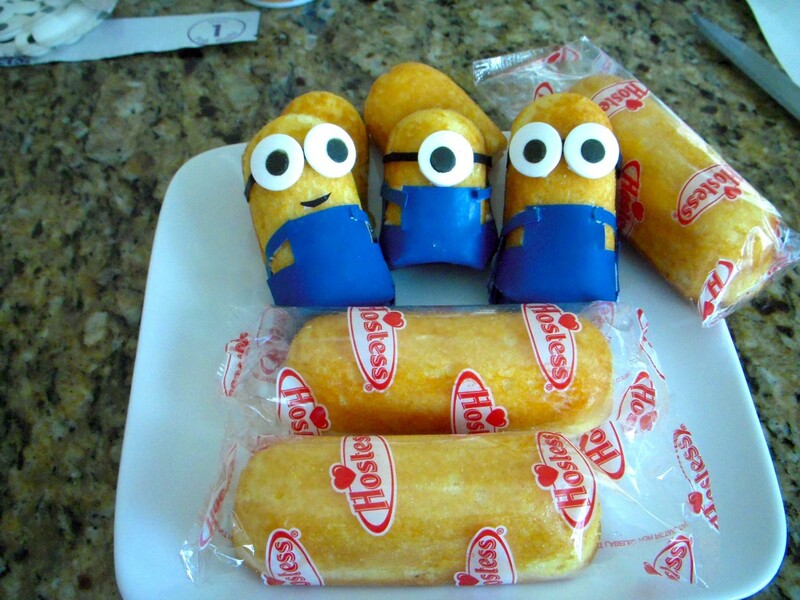 I love minions! Nice lens! @GrammieOlivia: Thank you grammieo. I appreciate you seeing behind the topics to how the lens was done. @TheEnglishHouse: I think they are pretty funny too. Really enjoyed this lens. 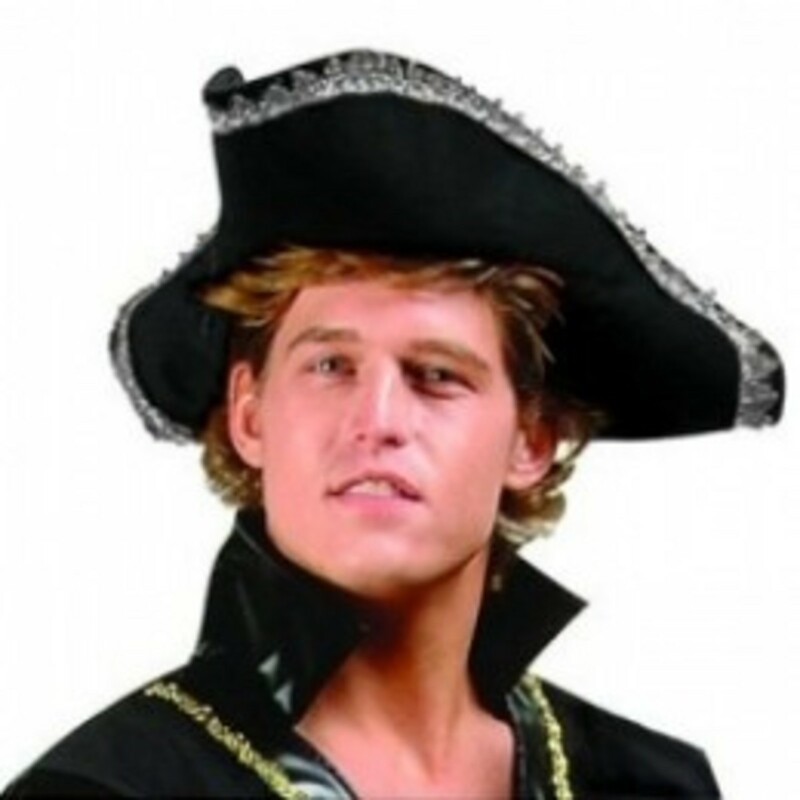 Like the use of Amazon modules to help with buying items needed for making the hat. 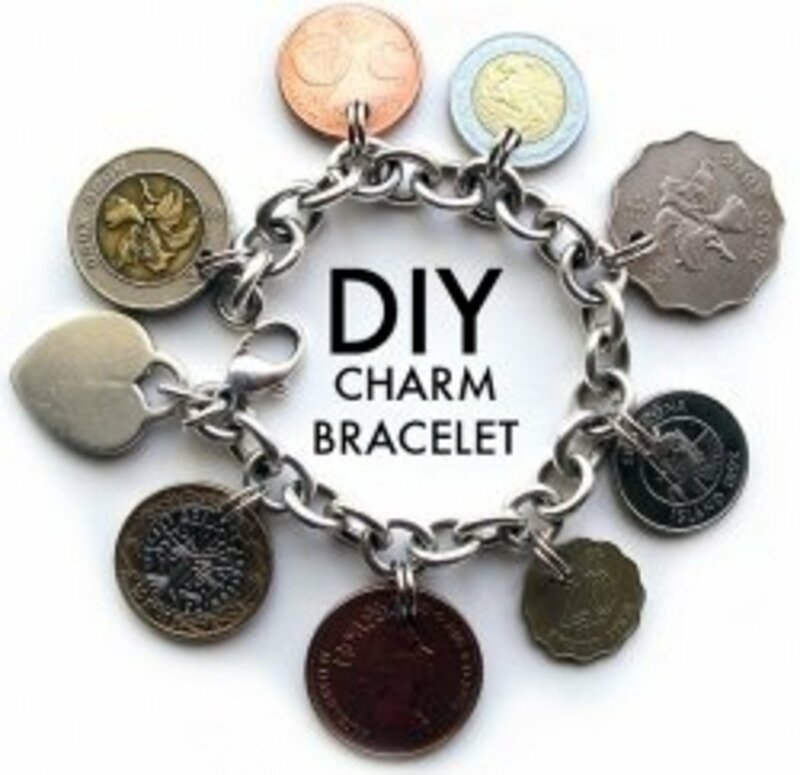 Very clever and creative. 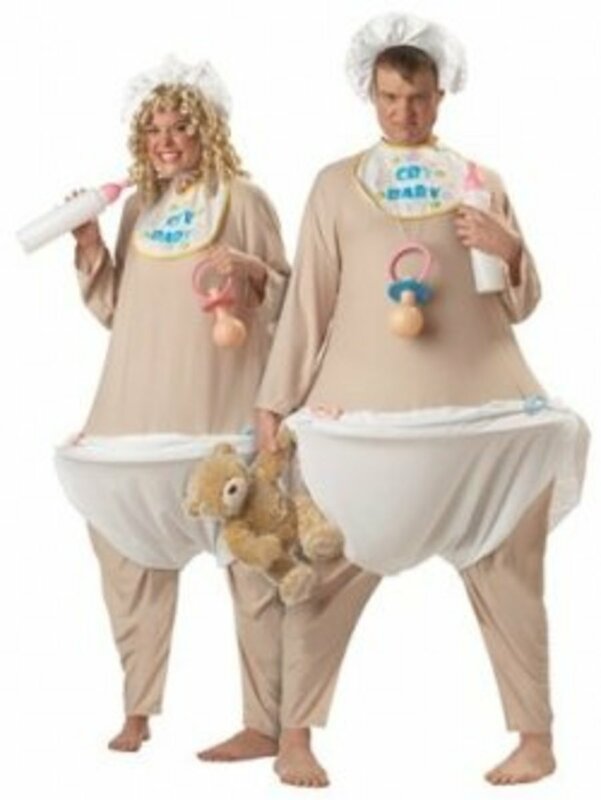 I think we're going to see lots of little minions out there this year for Halloween! @SheGetsCreative: I just love the minions. They make me smile. Thanks for pinning the lens. @Legenden: Thank you. I had a lot of fun putting it together. We're big Minion fans in this house.